The White Horse Inn InnAt the White Horse Inn we aim to give you a friendly, comfortable stay in our lively, country inn. We specialise in local real ales and serve food predominantly from local suppliers. 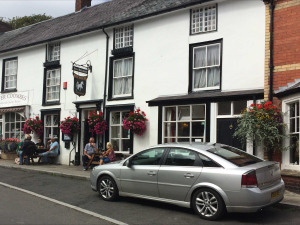 We are a great destination for people wanting to stay in this beautiful unspoilt part of the country; we are situated in the Shropshire Hills AONB, close to the Welsh Border, but still in England. The walks in this area are manifold; there are though other things to do with both Knighton and Ludlow golf course close by, as is Ludlow Racecourse. Although we serve satisfying food in the pub we are also close to the food centre of Ludlow with its many restaurants. Our accommodation has been awarded English Tourist Board 3 stars (INN) and has reached the criteria for Pets, Cyclists and Walkers Welcome. We have four comfortable, en-suite bedrooms all with colour, terrestrial television, and tea making facilities, our rates are £35.00 per person per night on a dual occupancy level and £37.50 per person per night for single occupancy. Children under 5 years old may stay in their parent's room for £10.00 per night and those under 14 for £15.00 per night. A lively county inn on the Shropshire borders. Perfect for a walking holiday or a relaxing pub break. The White Horse Inn sometimes limits bookings to 2 or more days. A compact room at the front of the property over the bar. There is a double bed and en-suite shower room. Beige sometimes limits bookings to 2 or more days. A double / twin room set to the front of the property over the adjacent butcher’s shop. The accommodation comprises of a double bed and a single bed. En suite shower room is included. Purple sometimes limits bookings to 2 or more days. Our largest room set to the front of the property over the bar. The accommodation comprises of a double bed and a single bed, there is room to put up a ‘z’ bed or cot if required. En suite shower room is adjacent. Red sometimes limits bookings to 2 or more days. From Craven Arms Train Station, 9 miles. Bus 745 runs from Craven Arms sporadically. We will make arrangements for pick up from the train station.